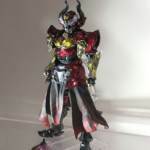 The hits from Tamashii World Tour keep coming with a trio of new S.I.C releases for Kamen Rider Gaim having been shown. 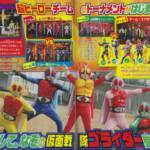 On display, we have S.I.C renditions of Kamen Rider Duke, Marika, and Sigurd who were previously shown as part of S.I.C Hero Saga this time shown in greater detail. No word was given on release date, or if these figures will even be released to the public. Stay tuned, and we’ll bring more up to date information as it’s made available. 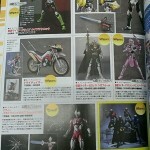 › Characters: Kamen Rider Duke, Kamen Rider Marika, Kamen Rider Sigurd › Toyline: S.I.C. 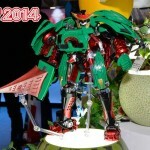 Tamashii Nations 2014 Reveals on Full Display! 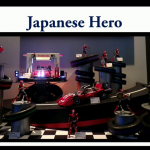 Just over 2 weeks ago the Tamashii Nations 2014 event was held in Japan. As is always the case the event held a number of spectacular reveals for Tokusatsu and non-toku fans alike. 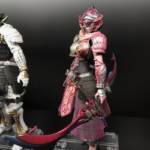 Even after the event ended the Tamashii Features twitter account was still sending out official hi-res images for each of the items on display, in some cases giving us our first official looks at items under photo bans. Well today brings us an AVALANCHE of new images running down the list of the tokusatsu items on display that were under such bans! S.H. Figuarts Kamen Rider Marika & Suika Arms Baron Officially Revealed! As Tamashii Nations 2014 continues we’re seeing more and more items that were on display earlier in the show but under a photo ban. Well no more for at least two figures. In a pair of images released by the Tamashii Features twitter account we have an official reveal of S.H. Figuarts Kamen Rider Marika and S.H. Figuarts Suika Arms (Kamen Rider Baron Version)! Both look absolutely stunning. These figures were present in the blurry image of the rather large and awesome Kamen Rider Gaim display we reported on Thursday. There are still quite a few figures reported to be in the same display actually like Jam, Mars, Kamuro, etc. As we get pics for more of them we’ll update you! As is usual with these larger Tamashii events there’s a photo ban in place on a select group of items at Tamashii Nations 2014. For whatever reasons there’s always a selection of figures at these thing you just can’t take pictures of. Generally they’re off in their own areas of the show but eventually someone sneaks camera shots of what’s in there. For now at least there are no pictures or at least no decent ones of quite a few more things than we realized. 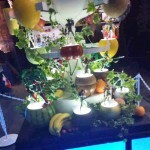 Updated with at least 1 image from the Kamen Rider Gaim display! That so far is all the yet to be pictured items that we know are physically at the show. That’s quite a lot of stuff. Frankly the grainy images we have seen show that the Gaim & Drive displays are huge and full of figures, really great set pieces. It would seem silly for the photo ban on those sets up to last through out the show. 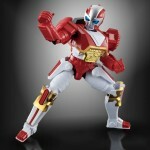 And the two additional Metal Heroes would be welcome among the numerous other fresh reveals yesterday. We’ll keep you posted if images for anything on this list turn up from the event. Tamashii Nations 2014 has just gotten underway in Japan and we’re already starting to see the initial reveals from the show floor! The show is still ongoing sso images and information are subject to change as we get updates. The show is still ongoing and new images and info are beginning to pour in. We’ll update this post as the show carries on!